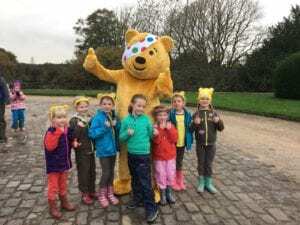 Over five hundred members of Girlguiding Stockport took part in a “Pudsey Walk” this weekend to raise funds for Children in Need. 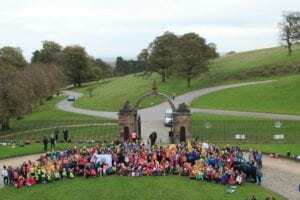 Despite the wind and rain of Storm Brian, Rainbows, Brownies, Guides, Senior Section, Leaders and members of the Trefoil Guild walked a variety of routes ranging from 1 mile to 5 miles into Lyme Park. 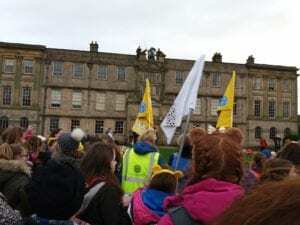 Many girls were wearing the iconic Pudsey ears, others with bows and neckers matching Pudsey’s bandage. 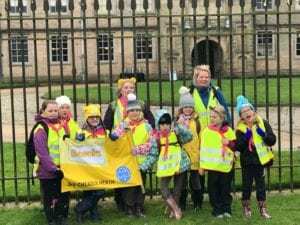 Flags proudly bearing their unit names waved high as the girls arrived in the courtyard, where they were met with high fives from Pudsey Bear Himself! 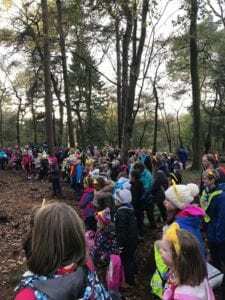 After a huge group photograph and a much-needed hot chocolate, the ramblers set off again to Hampers wood where a campfire had been lit by the park rangers, there they sang and danced as the sun finally arrived and peaked out through the trees. 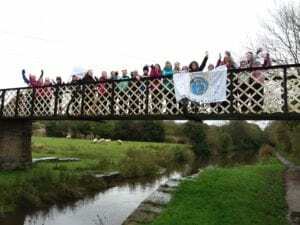 The walk was part of the Countryfile Ramble initiative for Children in Need and girls were sponsored to take part. So far over £3,000 has been raised and the money is still coming in.